The facility arc flash risk assessment is formerly known as the “arc flash hazard analysis” or sometimes referred to as an “arc flash study”. Many companies in North America are coming to grips with a new electrical safety concern – Arc Flash Safety. Often, the initial question that is raised by management is – does this even apply to our facility? In short, the answer is a resounding YES! In the United States, the Occupational Safety & Health Administration (OSHA) can and does cite companies who do not provide protection for their employees against arc flash & arc blast hazards. Although the OSHA 1910 standard does not specifically define all of the procedures and personal protective equipment (PPE ) necessa ry for a sufficient arc flash safety program, it does recognize the NFPA 70E standard as the best practices for implementation of a comprehensive electrical safety program. In Canada, the equivalent standard, Z462 is being developed in order to provide arc flash/blast protection for electrical workers. Z462 is based on NFPA 70E with some modifications so that it is in harmony with the Canadian Electric Code, but in principal is very similar to the US standard. Most companies do not have the expertise or do not wish to expend valuable resources required to interpret, assess and implement an energized electrical safety program- and that’s exactly where The Jacman Group comes in. We provide assistance to companies of all sizes to establish the required elements of an Electrical-Arc Flash Safety Program, including the Facility Arc Flash Risk Assessment, Worker Arc Flash-NFPA 70E Training, & the written Electrical Safety Program. The arc flash risk assessment is the process that is undertaken to determine the level of hazard that exists at each electrical enclosure such as a control panel, panelboard, disconnect switch or switchgear. There are several steps required to complete the assessment. There is a variety of information which is required in order to correctly document the power distribution system. This information includes data on circuit breakers, fuses, cabling, and end loads. At first glance, the data collection step sounds straightforward; however, most clients do not want to de-energize in order to collect this data. This task requires an experienced, skilled and qualified individual or team. Most engineers conduct the arc flash risk assessment by utilizing specialized software. In this phase, the engineer models the power distribution system based on the data collected. From this model, PPE categories, incident energy levels (calories/cm^2), and the arc flash boundaries for the electrical distribution system are determined. From the study results, most reputable consultants will analyze points in the system where the PPE Category 3 or above and make recommendations for possible system changes which would reduce the PPE category to an acceptable level. This is standard procedure for our group as is a review of the system for any major system coordination issues and insufficient fault bracing of electrical system components. We will identify problems and report them as a part of the arc flash report. The system model will allow for the addition of future information and study of the expanded power distribution system, if desired. We recommend that the electrical engineer conducting this study have background in power distribution and also be involved with other aspects of arc flash safety such as data collection, safety consulting and training. Our team utilizes industry-standard SKM Systems Analysis software to create detailed one-line diagram(s) of the electrical system and we include them with the project deliverables. 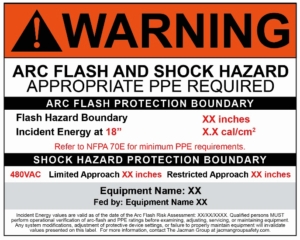 Arc Flash warning labels adhere to ANSI standards and shall be affixed to all equipment included in the assessment. Labels display the flash protection boundary, incident energy, work distance, required PPE level and the shock hazard voltage and boundaries. Once the arc flash risk assessment and labeling are complete, we can recommend the best clothing and PPE options based on the results of your study, the frequency that your maintenance personnel work in energized enclosures and other plant considerations. Please note, we have no affiliations with any PPE or fuse companies, we simply lay out a number of options for you to choose from that best suit your requirements and budget. Regardless of how much time is spent in the data collection, analysis, consulting and training stages, there are ALWAYS other questions that arise. We’re always here for you long after the completion of the project to answer any questions and continue to assist you through this ongoing process. Proper Arc Flash Safety Training is the key element of any effective program because even experienced electricians or maintenance personnel are not familiar with the hazards associated with electrical arc flash. Implementing The Jacman Group’s Arc Flash Safety Program will enable everyone trained to recognize hazards they’re exposed to daily and protect them in the event that an arc flash should occur. The Jacman Group’s unique training methodologies will leave each and every employee with a new respect for electricity, which in turn will make a safety environment for everyone. (2) To estimate the likelihood of occurrence of injury or damage to health and the potential severity of injury or damage to health. The arc flash risk assessment is required to be updated when major modifications/renovations take place or at a minimum of every 5 years. The Arc Flash/NFPA 70E electrical safety training should be conducted at a minimum of every three years, however most companies conduct this training annually. The Jacman Group provides a cost-effective, comprehensive arc flash risk assessment for facilities of all sizes across the United States. On-Site Data Collection: Our field experts collect all the necessary data from your electrical system. Electrical System Modeling: A digital model is created of your facility’s electrical distribution system and this model is used to complete the engineering analysis. Engineering Analysis: Multiple safety engineering analyses are performed including Short Circuit Analysis, Protective Device Coordination Analysis, Protective Device Interrupt Rating Analysis, and the Incident Energy Analysis. Report of Findings and Recommendations: The results are provided in both a printed and digital report, including any findings describing dangerous conditions within the facility and recommendations for mitigating these hazards. Equipment Labeling: Customized, NFPA 70E-compliant arc flash safety labels are provided for each piece of electrical equipment. Contact us for a free consultation and no-obligation quote, at no charge. Contact us for more information about our Arc Flash Safety Services and for a free consultation & quote. We can provide a quote to conduct your Arc Flash Risk Assessment at your facility at no charge and with no obligation. Other helpful links: What is Arc Flash? | What is NFPA 70E? | Why Choose Jacman Group?